This family monthly budget planner template to be reviewed is one that is both simple and easy to read. 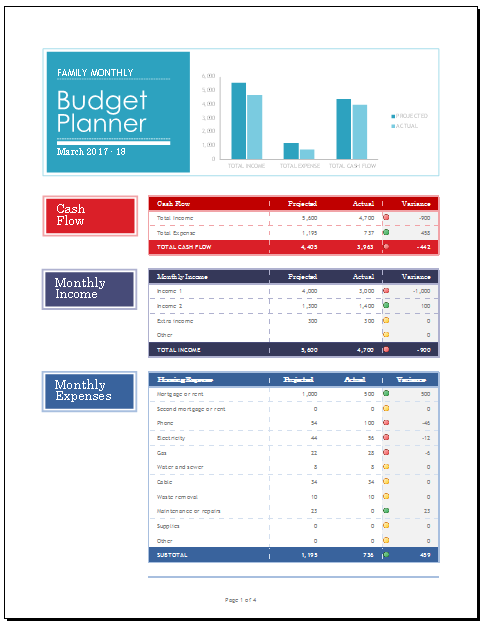 The top left-hand corner states that the document is a budget planner, and next to that is a bar graph showing three sections: total income, total expenses, and total cash flow. Underneath this graph, there are three other sections: cash flow, monthly income, and monthly expenses. In the first two of these sections, you will find special subsections involving income, expenses, while in the monthly expenses section, you will find information regarding basic amenities such as gas, electricity, water, telephone, and waste removal, as well as the total cost for these services. Each section will also contain three things in the “total” section: projected total, actual total, and variance. All in all, this budget plan template is fairly easy to use and edit to fit your needs and/or wants.